Different take on waffles that will make you wonder why you haven’t been eating them every morning. 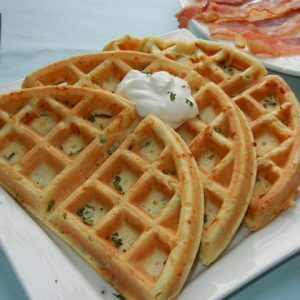 Savory waffles made with smoked cheddar cheese and scallions. Waffles are so much fun. I love making waffles but it is definitely a weekend breakfast. Experimenting with waffles can be very interesting. I’ve tried various fruity waffles and chocolate waffles but I haven’t tried savory waffles. Even my hubby was a little thrown off by waffles not being sweet. He got over it pretty quickly once he tried it. Its different, but so good! Rub the waffle maker with lightly-oiled paper towel and preheat your waffle maker. In a mixing bowl, whisk eggs vigorously for a few seconds. Whisk in the melted butter, milk and salt. Stir in the cheese and green onion. Let sit for about 10 minutes. Bake according to your waffle maker's specifications. 1. Rub the waffle maker with lightly-oiled paper towel and preheat your waffle maker. 2. In a mixing bowl, whisk eggs vigorously for a few seconds. 3. Whisk in the melted butter, milk and salt. 4. Add the flour and baking powder and stir until combined. 5. Stir in the cheese and green onion. Let sit for about 10 minutes. 6. Bake according to your waffle maker’s specifications. Previous Post: « Recipe Name Winner! Thank you for linking to Must Try Monday. Have you used waffles for sandwiches? These seem to be a good combination for doing so. Featuring this today on Serenity Saturday party!! This sounds so good — pinned! Thanks for linking on Busy Monday at A Pinch of Joy! Hope to see you again soon – the links are open! This is wonderful. Thanks for linking to Saturday Dishes.